It was cold, and raining again this morning, but we barely noticed. We were busy playing with playdough - playdough and electricity - bwa-ha-ha-ha!!! It's not quite as shocking as it sounds. I saw the forecast for today, last night, and decided to have the playdough standing by, as a boredom buster. But, knowing the older children would need something more exciting, I did a quick Internet search for playdough science projects, on the off chance there would be something interesting. That, led us to the University of St. Thomas' Squishy Circuit project page, where we learned that playdough, especially the homemade, cooked with salt and cream of tarter type, can conduct electricity. On the page, they have a recipe for playdough that will conduct electricity, and one (using sugar instead of salt), that won't, to use as an insulator. After reviewing a few of their videos, I decided, we might have all the supplies for the experiments already on hand, and went in search of them. Playdough, of course, was not a problem, we always have playdough. and even a small motor, with a removable propeller. Actually, I think the little motor was something we picked up at Radio shack back when we were doing wind power experiments, but everything else was in the kit. You might have noticed the layer of dust on the kit. It's one that's been sitting unused for a number of years. And, if you'd ask me last week, I'd probably have said it was a dud. The book, and accompanying experiments, never sparked the children's interest. However, when combined with play dough, and freedom to experiment, it all became very interesting, and exciting. We did find, that the battery pack we had, that held two, triple A batteries, did not provide enough power, to pass through the play dough. The battery pack from our Leapster though, which holds four, double A batteries, provided enough power to make the buzzer sound, but not to light the tiny light bulb, or run the motor. Without the playdough, in the circuit, there was plenty of power for everything. The children found other uses for the playdough - experimenting with inertia, and centrifugal force. They also made paper pinwheels, and discovered changing the direction of flow of power through our motor, changed the direction of the rotation, which meant, with the plastic propeller, they could make a fan, or a vacuum. 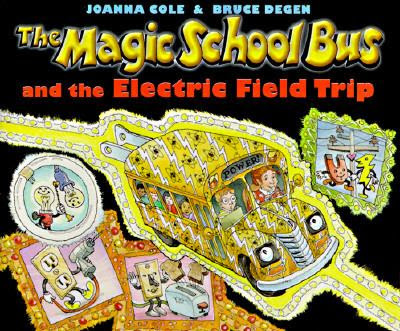 ...and "The Magic School Bus Gets Charged" (an animated episode, you can view here), it proved to be an educational afternoon, as well. So, to recap - Brighter Child All About Electricity Kit? Probably not. The components are good, but can be purchased inexpensively at a Radio Shack, or hobby stores. And, the book is lackluster, when compared with experiments, like the squishy circuits, that can be found online. Electric play dough sounds like something I'll have to share with T. He would really enjoy this type of experimenting. I'll skip the kit - thanks! I loved the electricity unit as a kid in junior high. My favorite, a matching game made using a file folder, aluminum foil, and waxed paper. Electric Playdough...what a unique concept. Yes, I find most kits not to be worth it. It is nice to hear another mom feel the same way I do about most kits. We seem to acquire them through gifts and I am always amazed at the contents of the box... and how little use most offer up. I want to be you when I grow up! Every time I come onto your blog I am amazed! I wonder what smart/fun thing you will do next. I love this way of exploring electricity! Maple Leaf Watermelon Pops - For Canada Day, eh?